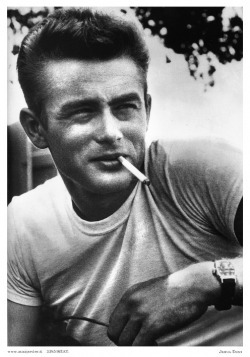 I would consider myself to be a James Dean fan. I have not seen all of his movies and wasn't born until 34yrs after his death but still, the guy is cool right? Right. Saturday in Indiana. Me and my friend Katie (also a 'Deaner' as the fans like to call themselves) took a little drive up to Fairmount which is a small town located North East of Indianapolis in Indiana. 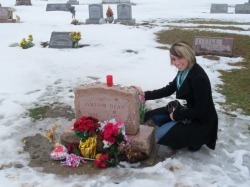 It was the birth place of James Dean and where his grave is today. Today was a strange day. It was cold and there was still snow on the ground but a thick mist had set in as well which gave the little town of Fairmount an eerie feel to it. Fairmount is a tiny tiny town where everyone know's everyone. As we asked for directions an elderly guy told us where we could find the grave. This was easy enough and as we were driving around the cemetery, we came across a very small headstone smothered in lipstick kisses. This was highly amusing if not a little morbid. Even in death the guy is getting the ladies. Laid around the grave were various flowers, candles and most interestingly, half smoked cigarettes. As this was his trademark it seemed ironic that he died in a car crash so young yet cig butts laid around a grave seemed almost appealing and heroic. I left an English £1 coin. Seemed stupid really but still, an English guy left his mark there. After the grave, we went to a museum that was really just a large old house. It had various artifacts and memorabilia all associated with the great man himself. What really made the trip though was the story that the guy working in the gift shop told us. My friend Katie who is a writer was so inspired by his story that she said she would like to produce a short fiction on it. I somehow feel that if I was to write his story here, it would not do it justice and I was telling a story that wasn't mine to tell so I'd suggest to anyone wanting to hear it, go visit Fairmount Indiana! The drive home was scenic yet eerie through because of all the fog. One small town after another reminded me of the close shared lives that Americans live. Katie showed me her town that she lived in as a kid and then where she would hang out as she got older. This culture seemed very alien to me, an English kid who spent his afternoon weekends playing Mario Kart round a friends and exploring beaches in Essex on bikes. So the evening of the Saturday followed and we went to some bars out in Broad Ripple. This is always fun on a Saturday. Dancing away, getting drunk and having a good time. Adrian Jackson - big James Dean fan.